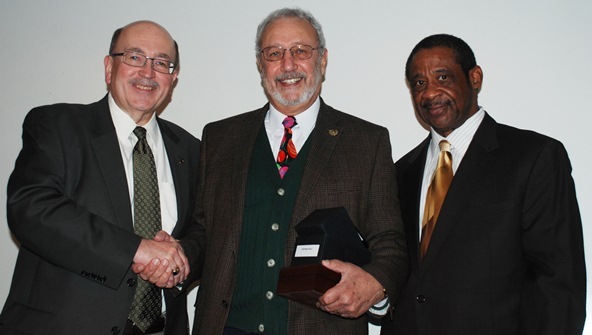 Former IAM Retirees, Community and Membership Services Director Charlie Micallef, center, was honored by IAM International President Tom Buffenbarger, left, and IAM General Secretary-Treasurer Robert Roach, Jr., right, before his retirement effective January 1, 2014. Charlie Micallef, who for the last three years has served as the IAM’s Retirees, Community and Membership Services Department Director, has announced his retirement effective January 1, 2014. Former Grand Lodge Representative Carlos San Miguel will serve as the new director of the department effective immediately. Micallef began his career with the IAM in 1988 as an Instructor at the William W. Winpisinger Center Education and Technology Center. He taught several courses on topics from collective bargaining to organizing and developed partnerships and college degree programs with the National Labor College and University of Massachusetts. In 2010, Micallef took over as Director of the Retirees, Community and Membership Services Department where he worked to meet the needs of 350,000 IAM retirees throughout the U.S. and Canada. He is a journeyman electrical distribution lineman by trade and holds a Ph.D. in labor studies from the Union Institute and University. Carlos San Miguel began his IAM career as a helicopter mechanic at Fort Rucker, a U.S. Army post in southeastern Alabama. He is a member of Local Lodge 2003 and served as the Chief Shop Steward at the air field and later as a Conductor-Sentinel. 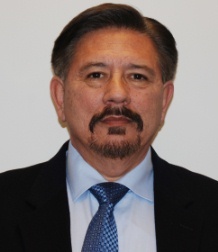 In 2004, San Miguel was asked to join the Southern Territory staff as an Organizing Apprentice and was appointed to the position of Special Representative in 2006. In 2009, he became a Grand Lodge Representative.